That great American author and historian Wallace Stegner once called the nation’s park system the best idea we ever had: “Absolutely American, absolutely democratic, they reflect us at our best rather than our worst.” So it’s no surprise that the Apple App Store and Google Play are all too happy to contribute the mobile digital take on America’s heritage, and arguably, its future. 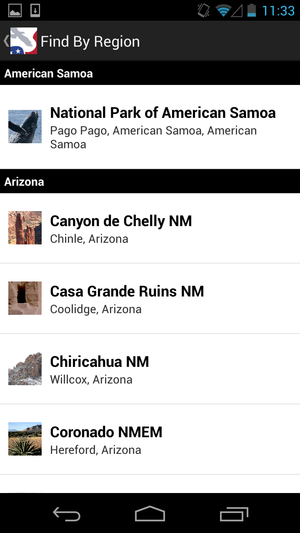 If you’re carrying your smartphone on vacation in one or more of the 50 states, iOS and Android apps will provide all the guidance you’ll need to traverse the often-challenging terrain of the nation’s 59 national parks, part of the 401-strong network of parks, monuments, preserves, recreation areas, and assorted open spaces, overseen by the government. 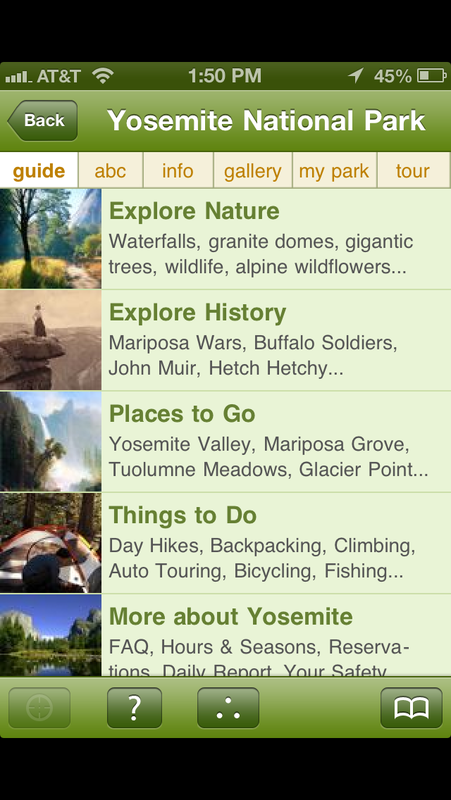 National park guides, as well as localized state and regional guides, are mostly found in the app stores’ Travel category, though sometime also in the Navigation or Education sections. Most apps are free, though sometimes the free app is a shell under which in-app or adjunct purchases are needed to fill in detail and park-specific information. 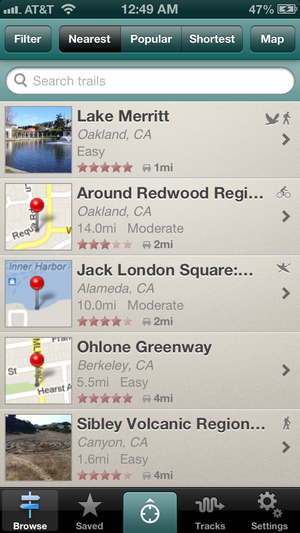 A free app can help you decide where to go, and which supplemental app to buy. Happily, even in-app purchases are reasonably priced—much less than the tank of gas you’ll likely spend getting from your house to the open road. 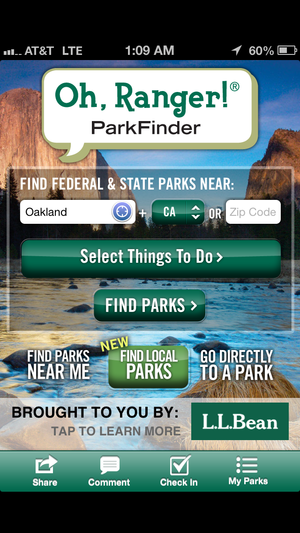 Almost all the apps are smartphone optimized, but many are tablet friendly too, so depending on how light you travel, or whether you plan your trek in a motel room, a tent, or an RV, you can use a tablet for a big-screen view of many National Park apps. 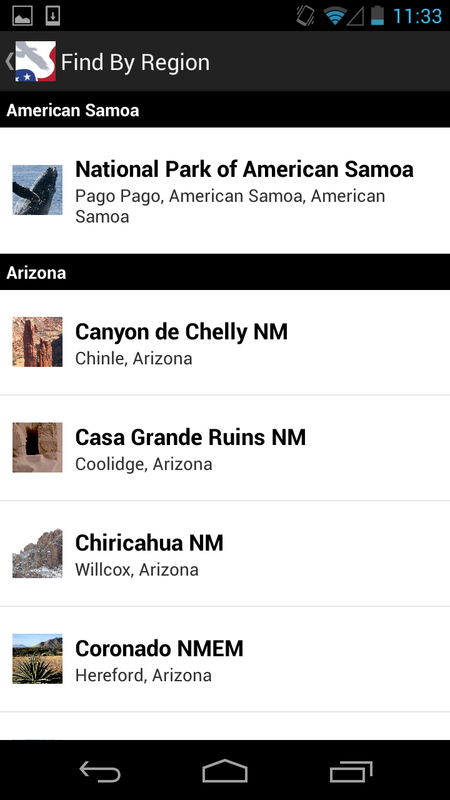 Count on using apps while in civilization, as it’s hard to predict where within a national park you will have a cellular network available, no less an open wireless hotspot. 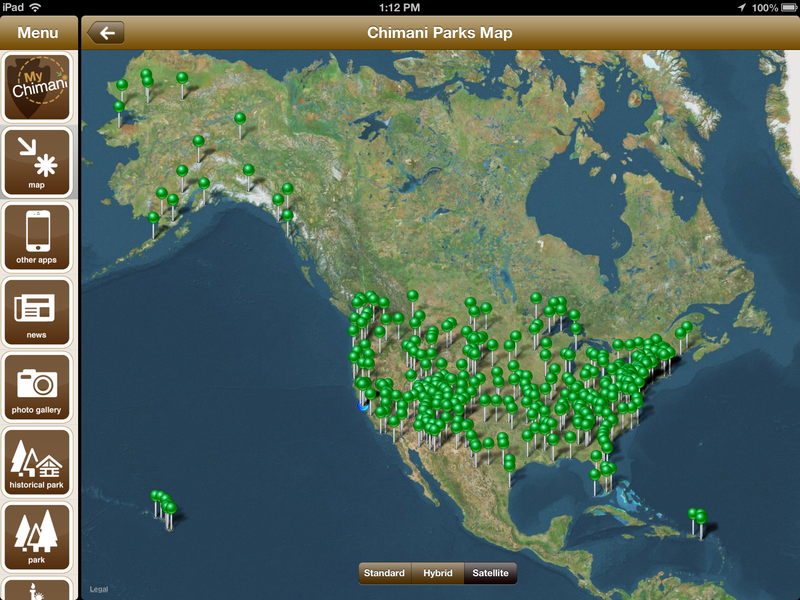 Some parks are now heavily wired, especially around campgrounds, but some wilderness areas still have no service. Which is kind of the point, after all. 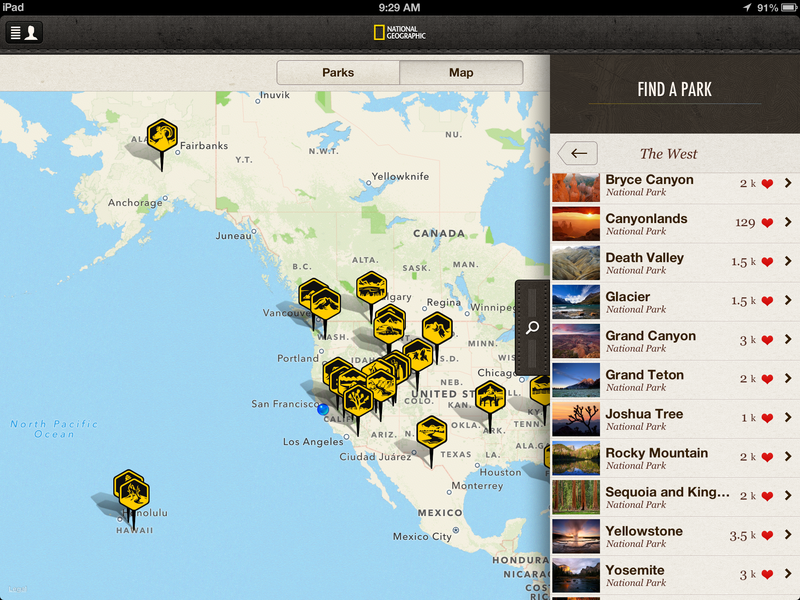 National Geographic for the iPad gives you the listing of 25 major U.S. national parks. Eastern National’s Passport to your National Parks references all of America’s national parks with its signature passport program, dating back to 1986 as a way to help park visitors record and remember their visits and participate in its stamp cancellation program. No matter where you are located, the Sierra Club Trail Explorer will help you discover the right hike for your physical condition, time limit, and state of mind. This free iPhone app taps into the AllTrails.com database for comprehensive location-based or searchable information. 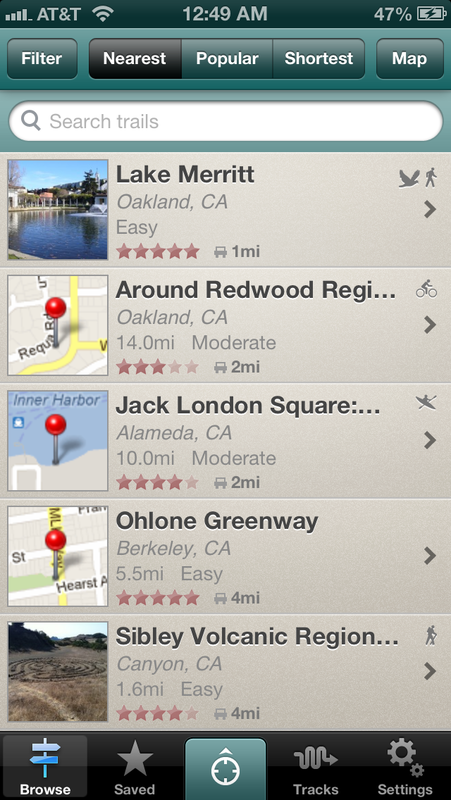 AllTrails also has its own app, which looks identical to the Sierra Club guide. 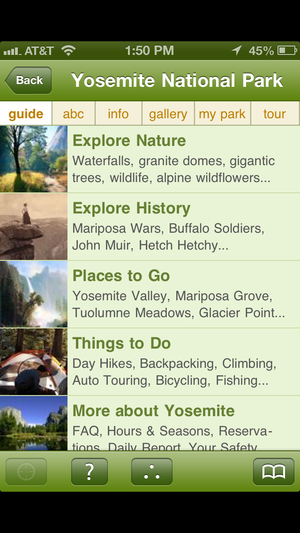 Any information you record on the Sierra Club Trail Explorer goes into the AllTrails database. 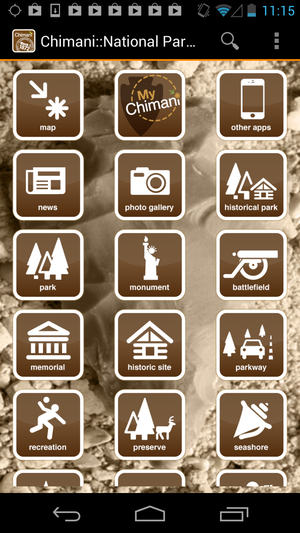 A number of apps view the park system through a narrower optic, such as Dan Marsh’s US National Parks Timeline, which uses a quick timeline approach for information on park location, name, and founding date, but not much more. 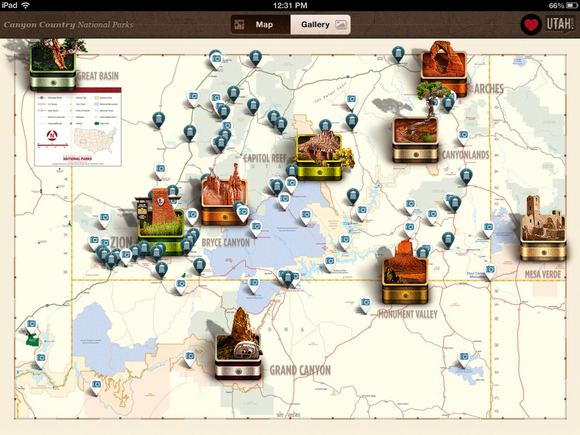 There are also specialty apps for certain parks, such as GeoQuest Technology’s Bryce Canyon National Park and Zion National Park apps for both iOS and Android, and that, if you’re visiting them, will surely add depth to your trip, as does Sutro Media’s Total Tetons Travel, which offers in-depth information about the Grand Tetons and the Jackson Hole area, and TUA Outdoors’ Hiking the Top 11, with information about 11 premiere hikes, complete with descriptions and maps. Be sure to check out TUA’s many other $2 apps that concentrate on specific parks. Washington DC is an intense place, and I wish I had the National Park Service’s free National Mall and Memorial Parks app when I last visited the capitol, for its wealth of information and historical depth on what to see and do. For the sheer spectacular beauty of the parks, be sure to have a look at Foronaut’s Fotopedia National Parks, which features spectacular images from photographer QT Luong. This story, "National Park apps aid your trek from sea to shining sea" was originally published by TechHive.